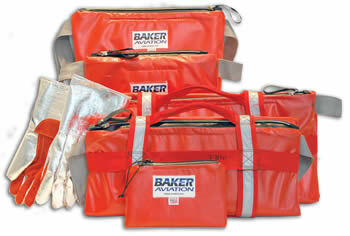 Baker Aviation, the Master Distributor for the HOT-STOP ’L’ Fire Containment Kits, has released successful test results from an FAA-registered independent lab, supporting the HOT-STOP ‘L’ fire proof design and its capability to fully contain lithium-ion battery runaways of powerful portable devices without the release of toxic smoke and without the use of any aqueous liquids. As an FAA-registered independent test laboratory, Aeroblaze specializes in flammability testing for aerospace materials. They provide the highest quality testing as evidenced by their accreditation to the international quality standards of ISO/IEC 17025 and Nadcap NMMT. Three HOT-STOP ‘L’ tests were recently conducted and documented for Industrial Energy Products, Inc., the manufacturer of the kits, by Aeroblaze Laboratory in Fort Worth, Texas. 1. Fire Resistant: the capacity to withstand the heat associated with fire at least as well as aluminum alloy in dimensions appropriate for the purpose for which they are used. 2. Fire Proof: the capacity to withstand the heat associated with fire at least as well as steel in dimensions appropriate for the purpose for which they are used. The HOT-STOP 'L' Fire Containment Kit successfully prevented the high-intensity flame from penetrating through its wall. The Containment Kit passed both the five-minute Fire Resistant test and the fifteen-minute Fire Proof test. Following the results of this testing, the HOT-STOP 'L' Fire Containment Kit can be considered Fire Proof as defined by the Code of Federal Regulations (14 CFR 1.1) and as demonstrated by the Federal Aviation Administration’s (AC 20-135) test procedure. Based on the 14 CFR 1.1 definition of Fire Proof, the HOT-STOP 'L' Fire Containment Kit has the capacity to withstand the heat associated with fire at least as well as steel in dimensions appropriate for the purpose for which it is used (14 CFR 1.1). The device used for testing was a 7.9” tablet with a Li-Po 23.8 Wh battery. The battery was comprised of 2 rectangular cells. The device was charged to 100% battery prior to testing. A propane torch was used to heat the backside of the tablet until thermal runaway occurred. During this test, both cells went into thermal runaway simultaneously. Once thermal runaway was initiated, the tablet was immediately dropped into the containment kit. Once the outer zipper was closed, the kit was left alone for observation for approximately 20 minutes. During that time, no further propagation of thermal runaway occurred, and no smoke was observed exiting the bag. The HOT-STOP 'L' Fire Containment Kit successfully contained the thermal runaway and the resulting fire of the tablet. No evidence of smoke was seen coming out of the kit after it was sealed. Following the test, it was determined that both cells had experienced thermal runaway. After examining the containment kit, no damage was found internally or externally. The HOT-STOP 'L' Fire Containment Kit successfully contained the thermal runaway and the resulting fire of the laptop in both tests. Previous testing on Lithium Ion batteries resulted in propagation of the thermal runaway to adjacent cells. In both tests performed inside the storage bag, the thermal runaway was limited to the single cell triggered and no propagation occurred, suggesting that the HOT-STOP® 'L' Fire Containment Kit is suppressing the resulting fire and preventing propagation to adjacent cells. No evidence of smoke was seen coming out of the kit after it was sealed in either test. Only minor damage to the inner-most liner of the bag was found after the first round of testing, and no additional damage after the second round of testing. The damage did not extend to the primary inner liner nor to the exterior of the bag. Test videos and copies of the laboratory test reports can be viewed here from the HOT-STOPL.com website.